This is a Sponsored post written by me on behalf of Norwegian Salmon for SocialSpark. All opinions are 100% mine. Today we're taking a little culinary trip to beautiful Norway! 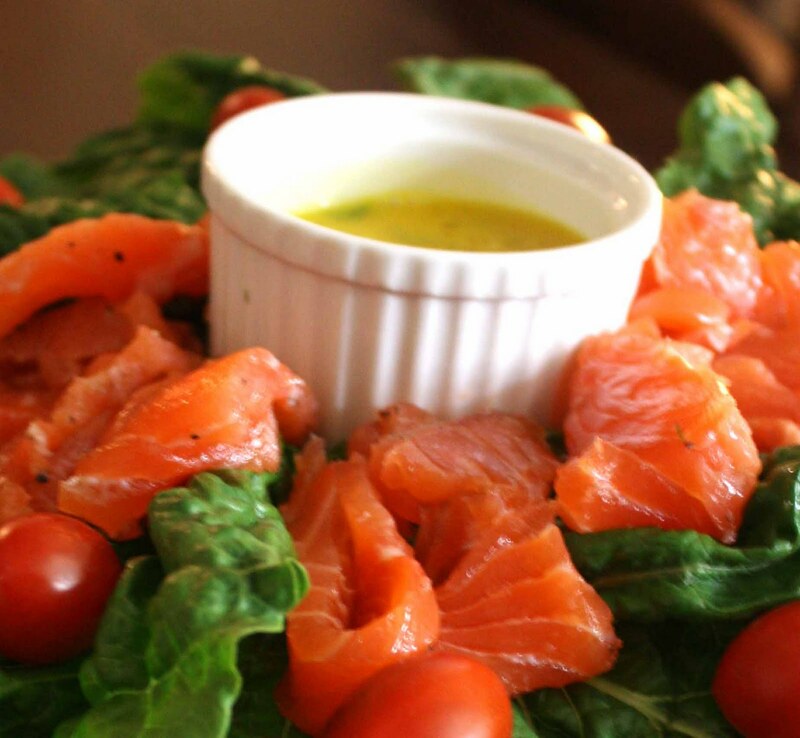 No Norwegian lunch would be complete without one of Norway’s most distinctive dishes, gravlax. The name literally means “Grave-Salmon” and refers to the medieval practice of curing the raw fish by burying it in the sand above the high tide level. Not only is this a fantastic dish, Norwegian Salmon provides the most amazing ocean-farmed salmon that you have ever tasted!! I absolutely love this salmon, not only because it's delicious but because it is produced in a safe environment with complete traceability. Even though I'm a busy parent, I'm also a foodie and foodies know that when it comes to finding authentic, superior tasting foods, origin matters. As you know, Norwegians have a passion and love for the sea that began thousands of years ago. I think that because their culture is so tied to our oceans, they know how to responsibly provide the finest, freshest seafood. 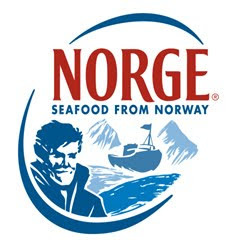 (In fact, Norway’s seafood industry pioneered the development of responsible ocean salmon-farming in the early 1970’s!). “The analogy I would give is that farmers in Norway are treating their salmon the way our organic farmers in the U.S. treat their farms,” said Ashley Koff, R.D., M.S., on a Good Morning America Health Segment, May 5, 2011, after also participating in an educational trip to Norway in April of 2011. The salmon are grown slowly, as nature intended. They spend the first year of their life in hatchery tanks on land until they are strong enough for life in the sea. 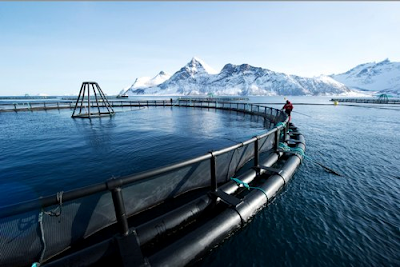 Then after one year, the salmon are carefully transferred to spacious, protected pens in the ocean. These pens are very large and allow the salmon maximum freedom to grow. Norwegian law even dictates that these pens must be 97.5 percent water to allow maximum comfort for the salmon. At every point of the salmon’s development, they are being monitored closely. Technologically advanced systems help farmers and vegetarians monitor every aspect of their life, including when they are hungry and full. The salmon are fed an all-natural diet, which consists of ½ marine raw materials like fish oil and fishmeal from wild fish and ½ vegetable raw, material, plus vitamins, minerals and antioxidants. Did you know that the recent dietary guidelines from the USDA’s new “My Plate” recommend at least 2 servings of fish a week? The World Health Organization has also recommended increasing seafood intake as a way to improve the general health of the world’s population. These guidelines make incorporating protein-rich fish like salmon in our diets even more important than ever. 1. Trim salmon fillets. Scrape the skin well and remove all bones (if any). 2. Blend salt, sugar and pepper. Sprinkle half of the salt mixture in the bottom of a roasting pan, then sprinkle half of the dill over and place the fillet in the pan skin side down. 3. Press the remaining salt mixture and dill on the flesh side of the fillet, using light pressure. 4. Put fish in the refrigerator for 3-4 days. Turn it every day. 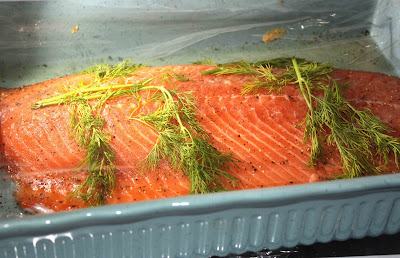 Scrape seasoning and dill from the fillets before serving. 5. Add salt to the egg yolks and stir until it reaches a thick consistency. Slowly pour in the oil while whisking quickly until the sauce is a consistency similar to mayonnaise. 6. Stir sugar, vinegar, pepper and mustard into the sauce. Just before use add the dill. The sauce will keep in the refrigerator for up to 1 week. 7. Cut the salmon into thin slices and serve with gravy, stewed potatoes or bread and salad. Growing up in Lovund, an island on Norway’s ragged coast dotted with steep mountains rising from the Norwegian sea, Aino Olaisen’s childhood memories are deeply connected to the seafaring traditions that continue to sustain this small fishing village of just 423 residents. Now the owner of Nova Sea AS, a 35-year-old salmon farming company started by her father Steinar in 1972, Aino takes great pride in carrying on her family’s business and devotion to providing the freshest salmon available through the basic principles of integrity, honesty and unsurpassed quality. In fact, the farmers in Lovund provide more than 425 million meals every year for the global salmon market directly from their cold, clear coastal waters. Describing her company as a high-technology global business that’s highly regulated for traceability and safety, Aino says the business provides a simple way of living and harvesting from the ocean that makes food production a pleasure shared by everyone in this vital Norwegian industry. Since the first batch of 1,200 juvenile salmon, or smolt, were shipped in plastic bags to Lovund to start farming in the early 1970’s, Aino watched her father struggle to establish salmon farming as a means to reverse the trend of depopulation and depression in Lovund’s local trade and industry at that time. After years of research, experiments and round-the-clock work to ensure the salmon’s survival, the first salmon farms began growing. Since then, Lovund has flourished as a natural source of fresh salmon and cod, slowly grown as nature intended in the cold, clear Norwegian waters. Born just a few years after the company was started, food production has been a natural and important part of Aino’s life ever since. She started contributing to the family business at an early age, spending her summer vacations working on the farm. At age 16, Aino left Lovund to continue her education and later attended the Norwegian College of Fishery Science in Tromso. After 15 years of study and travel in Denmark, Ecuador and France, Aino returned home to start a family and continue with the business in the hopes of passing down these traditions to her own family. 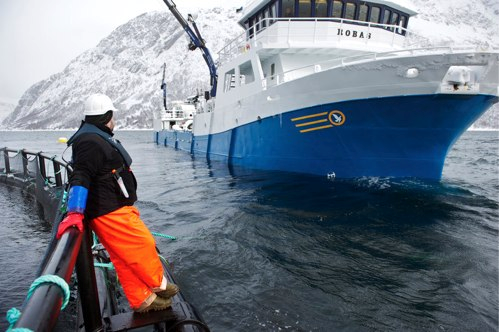 Today, Norway is one of the world’s largest suppliers of seafood, including wild and farmed fish, with more than 27 million meals including Norwegian Seafood consumed worldwide every day. Ocean-farmed Norwegian salmon is available fresh year-round, is easy to prepare and is a good investment in your family’s health. For more information about ocean-farmed salmon from Norway, visit salmon from Norway. It's a possibility that I might get to go to Norway this spring and I would like nothing better than seeing firsthand their love and dedication to responsible fishing. I will definitely bring you on the adventure (virtually:)) if it happens! This sponsored post is written by myself on behalf of Norwegian Salmonfor SocialSpark. All opinions, as always, are my own. Soooo, I thought for the last few weeks of this month I'd feature some traditional Holiday Foods from around the world! 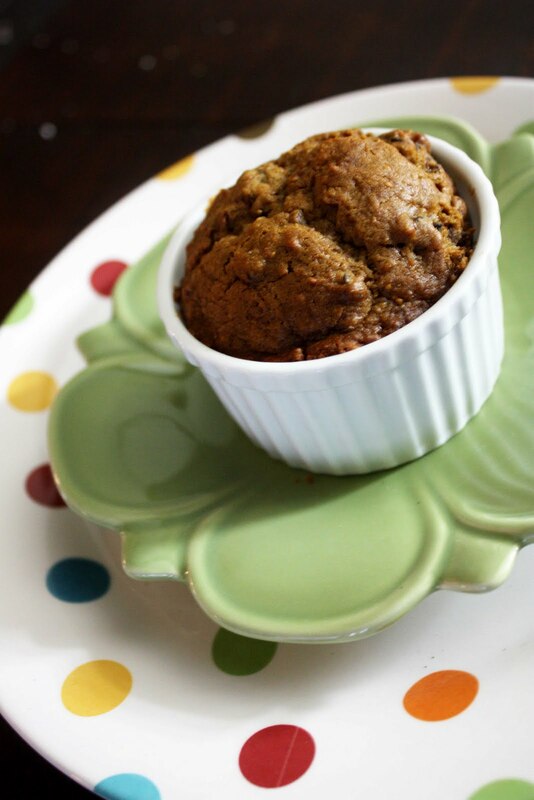 Last week, Little C's teacher mentioned to me that she's like the class to try Figgy Pudding. My first thought was "Rum? Figs? Suet? Spices? Hours of baking?! This NOT a kid-friendly recipe!" However, we put together our own from many of the recipes out there and I sent it off to school...Little C came home happily reporting that the class LOVED it and she wondered if there was any more at home....! 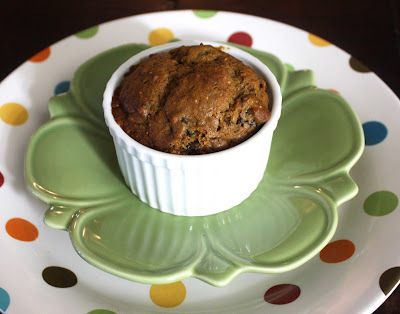 So, here's our "kid-friendly" Figgy Pudding recipe. If your kids haven't tried Figgy Pudding yet, make a batch together, download Bing Crosby's version of "We Wish You a Merry Christmas" and enjoy! Preheat Oven to 325 degrees F. Whip butter until creamy then add molasses and mix well. Add eggs, one at a time, beating after each. Add buttermilk and mix well. Add baking soda, baking powder, salt, cinnamon, nutmeg and lemon zest. Mix well. Add flour and mix well. Remove any stems from figs and chop figs and currants into fine pieces (I used the food processor!). Add figs and currants to batter mixture. Bake in ramekins (25 minutes at 325 degrees), mini muffin tins (15 minutes at 325 degrees), or a large tube pan (1 hour at 325 degrees). You will know the cake is done when a toothpick comes out clean. Serve with Ginger-Rum Whipped Cream (optional). NOTE: We found that this actually tasted better the second day! The flavors had some time to combine/mellow and the cake had a nice texture. Beat cream and sugar until soft peaks form. Fold in rum extract and ginger. Serve on top of Figgy Puddings. A few fun facts: Figgy Pudding dates back to the 15th century but was most popular during the 1800s. It's traditionally made with suet (an animal fat found near their kidneys) but butter works for us. :) Steaming was the traditional way of cooking and would take 3-4 hours! It’s the Holiday season and time for COOKIES! Hosting a Cookie Exchange can be stressful but no need to worry...I'm sharing my top ten tips and tricks to make sure your event is fabulous and fun for everyone. 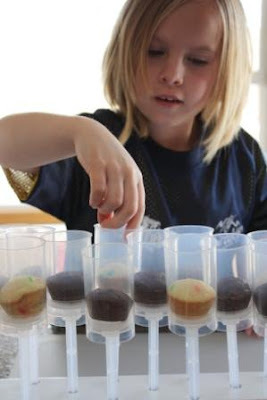 Plus, these ideas will help you “multi-task” by earning Box Tops for Education for your school! 1) Grab Ziploc® Brand Snap ‘n Seal Containers so you have plenty on hand to pack up cookies. They make it so easy with all the cute Holiday prints available! 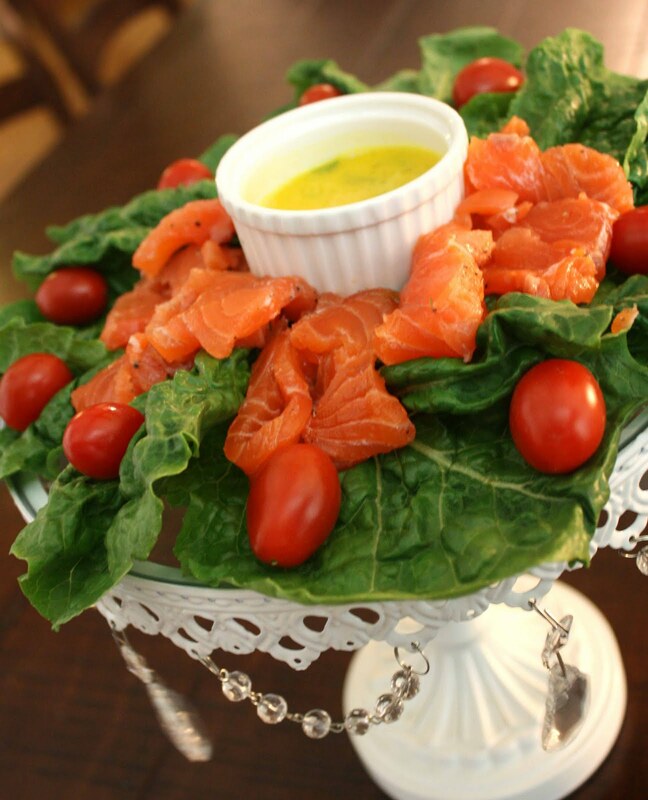 You can even stack them in a basket for a fun centerpiece and easy packaging. 2) If you have a lot of people participating, have Ziploc® Brand Freezer Bags on hand so guests can freeze their cookies for later use during the Holidays. 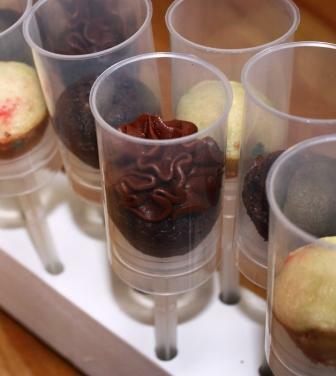 3) Print out recipe cards and place them on the table with festive pens so people can swap their favorite recipes. 4) Grab a package of Avery® Adhesive Name Badges. You can use them as name tags if your guests don’t know each other AND on your packages as easy cookie labels. 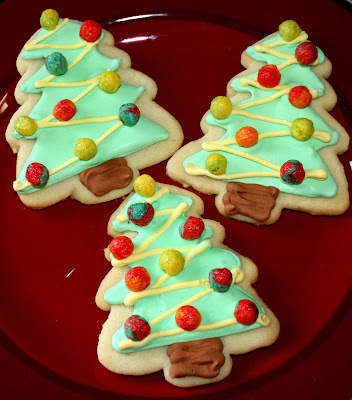 5) For easy Winter Scene cookies, dip Bugles® snacks in green candy melts and set aside to harden. Frost sugar cookies with Betty Crocker® White Frosting (snow) and add a few Bugles (trees) along with your favorite festive sprinkles. 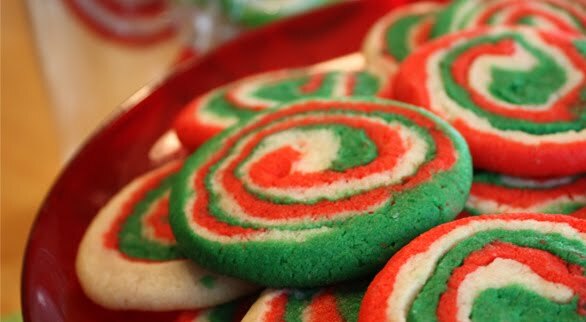 6) Start with Betty Crocker® Sugar Cookie Mix. Make the dough as directed then use food coloring to tint one half red and one half green (you can also leave some of the dough white if desired). Roll out each into a rectangle, place on top of each other and roll into a log. Slice and bake for beautiful Christmas Pinwheel cookies! 8) If you want to serve savory snacks along with cookies to your guests, make up a veggie tray and grab some packages of Chex Mix® Snack Mix. Everyone can munch and chat while exchanging cookies and recipes. 9) Don’t forget the music! Download some of your favorite Holiday songs and have them playing in the background for a festive touch to your party. 10) To help earn Box Tops for your kids’ schools and for some extra fun, bake a few dozen extra cookies. Let everyone take an extra cookie for each Box Top they bring to the party! Do you have a cookie swap tip or a great cookie recipe to share? If so, leave it in the comments! What are you serving on your Kids' Table this Thanksgiving? 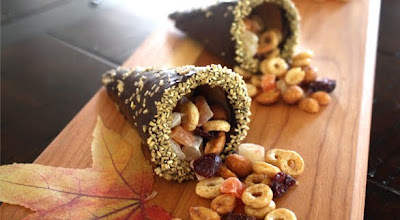 How about these cute Cornucopia Snacks we whipped up for Tablespoon? Click here or on the image below to get the recipe. 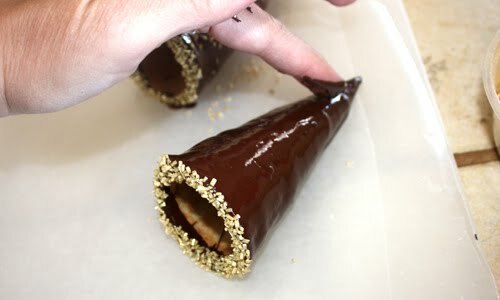 The easiest way I found to coat your ice cream cones is to hold them by the tip and roll them in chocolate... Dip in sprinkles, lay them on wax paper and smooth out the end with your finger. Easy! When dry, fill with your snack mix and serve! If you have a great idea for the Kids Table at Thanksgiving, please put a link in the comments! 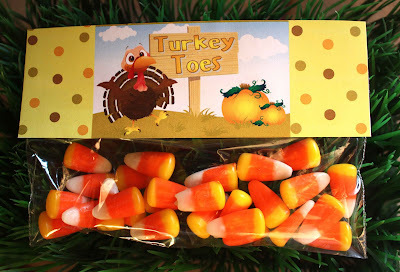 A couple days ago, I saw these adorable jars of "Turkey Toes" on Pinterest from No Fuss Fabulous. What a great idea to use your leftover Candy Corn!So, we decided to make our own version...something easy to send to school as a class treat or as a cute snack on your Thanksgiving table! 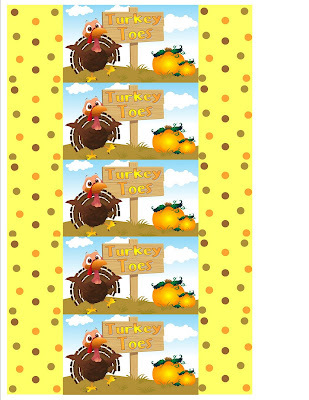 We used snack size sandwich baggies and I made some labels that you can download here. These are so easy to assemble! 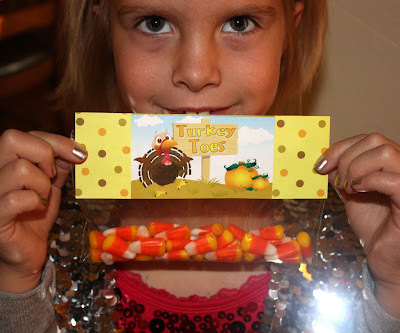 Simply put about 1/4 cup of candy corn in each baggie, cut out labels and attach with double-sided tape. If you're looking for candy corn, it's on sale this week at Kroger/King Soopers for $1 (in the candy aisle, green bag). 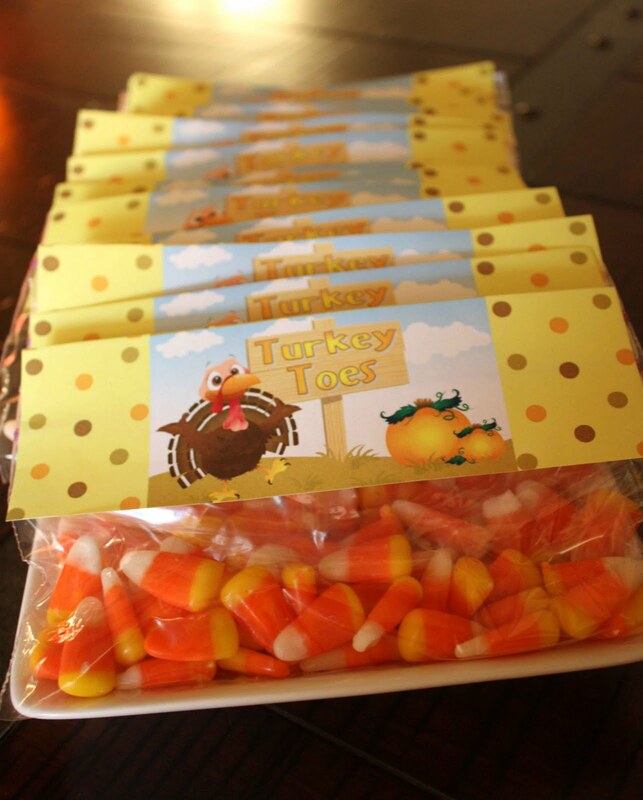 One bag of candy corn will make about 8 bags of Turkey Toes. Little C is excited to take them to class today! Time's up! We have a winner! "I like twix on facebook! :)"
I dropped you an email, Please send me your contact info by this afternoon so we can get your package to you by Halloween! • Fruit-flavored non-chocolate Halloween treats get no respect: Only 3 percent of all adults surveyed listed fruit-flavored non-chocolate treats as their Halloween favorite. The winning treat combination? Chocolate with peanuts or peanut butter topped the list at 39 percent, followed by a chocolate and caramel combination as a close second (30 percent). 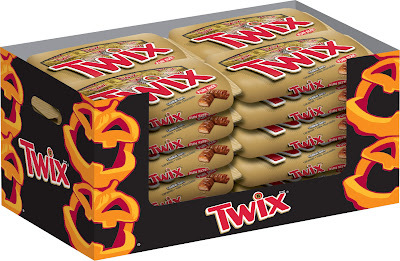 Phew, good thing TWIX bars come in classic TWIX® Caramel and TWIX® Peanut Butter. 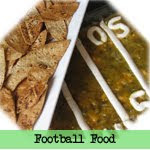 • Men seek the crunch; the ladies prefer something they can chew on: When it comes to treats, women prefer chewy treats more than men do (42 percent to 33 percent), while more men than women seek out treats with a crunch (33 percent to 23 percent). 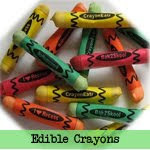 • Taking candy from a baby: One quarter of all adults surveyed (26 percent) admit to taking candy from their child’s Halloween stash or a friend’s or co-worker’s candy dish and denying it. I hope you're all having fun gearing up for Halloween! Disclosure: Twix provided the information and products for this giveaway. I was not compensated for this post and all opinions, as always, are my own. This summer, my friend Bridget over at Bake at 350 got me hooked on the new Biscoff Spread! I've always loved Biscoff Cookies (I even served them at my wedding!) so you can imagine how excited I was when Biscoff put all that luscious taste into a creamy spread!! Directions: In a medium saucepan, combine corn syrup and brown sugar over medium heat until bubbly then cook an additional 30 seconds, stirring often. Remove from heat and stir in all other ingredients except chocolate chips. Let sit for 10 minutes until cool enough to handle. Roll into 1” balls and place on wax paper. 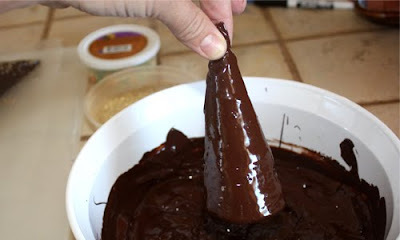 Melt chocolate chips in a microwave safe bowl at 30 second intervals, stirring after each, until melted and smooth. Drizzle over balls and let set completely, about 10 minutes. 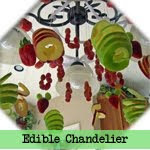 Store in airtight container up to 1 week. Roll one slice bread flat with a rolling pin and cut off crusts (optional). Spread 1 tablespoon Biscoff spread on bread, covering 2/3 of the bread. Spread 2 teaspoons jelly on top of the Biscoff spread. Roll up bread, starting at the end covered with Biscoff spread. Cut into slices with a sharp knife and place in container. Repeat steps with second slice of bread. (optional: garnish with fake “sushi grass” and serve with chopsticks). We entered these two recipes in Biscoff's Lunch Envy Challenge! Go here to check it out and join in on the fun! I realized that these would also be super cute for a "not-too-spooky" Halloween treat or a Letter F snack! Unwrap Ho Hos and place on wax paper. Melt chocolate and drizzle lengthwise over Ho Ho's to give them a "wood texture". Place two gummy frogs on the top of each and let set completely, about 10 minutes. Tips: after the girls drizzed the chocolate, I moved each Ho Ho a little bit on the wax paper so they didn't have big chocolate strings on the end. Or, you can just break them off after drying. For the dessert stand, we simply bought a cross cut of wood at the craft store and Gourmet Dad cut a log for me. 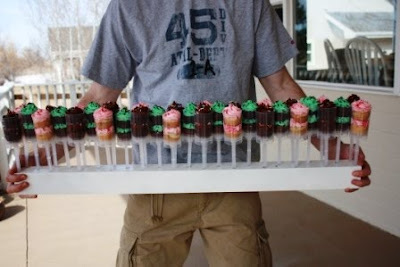 We used epoxy to glue them together and you have an instant rustic cake/dessert stand! I will post soon the rest of the dowloads/ideas for the Camping Party, I apologize to those of you who have been waiting for it! 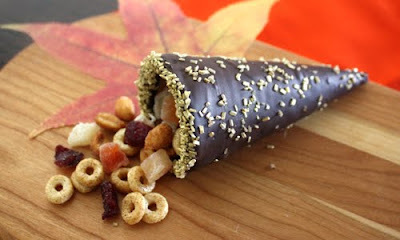 In the meantime, I saw this adorable idea over on Pinterest (original version from Supermom Moments) and knew it would be the perfect little Columbus Day snack for Little C's school class. 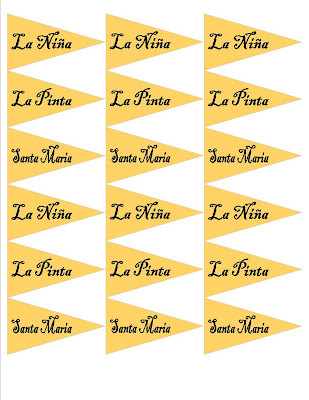 Here is our version as well as a dowload for the flags I made. These are so easy! All you need is clear cups, blue Jell-o, orange slices, toothpicks, and flags (I cut them out and glued them to the toothpicks). Click here or on the image below to download the flags. Enjoy! We'll be back soon with more fun! We are gearing up for Big C's Camping Birthday Party tomorrow! (No, we're not camping, just doing all the fun things that go with it). 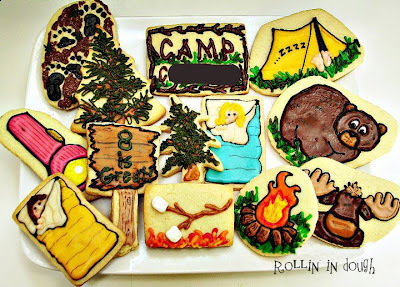 We'll be featuring a lot of the goodies and games but first I wanted to give you a sneek peek of the cookies that Kay from Rollin in Dough made for the party... Wow! Is she talented or what?! The good news for all you party animals is that she DOES ship her cookies & you can check out her Etsy shop here. We'll be back soon with more party details and lots of fun "camping" goodies and games! 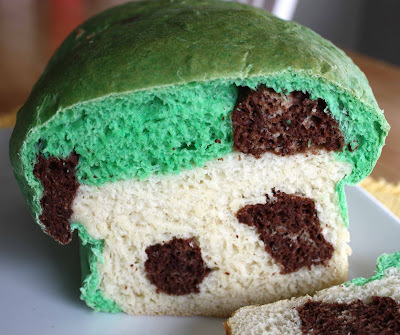 I recently came across an adorable recipe for Panda Bread on Tablespoon and had to try it! 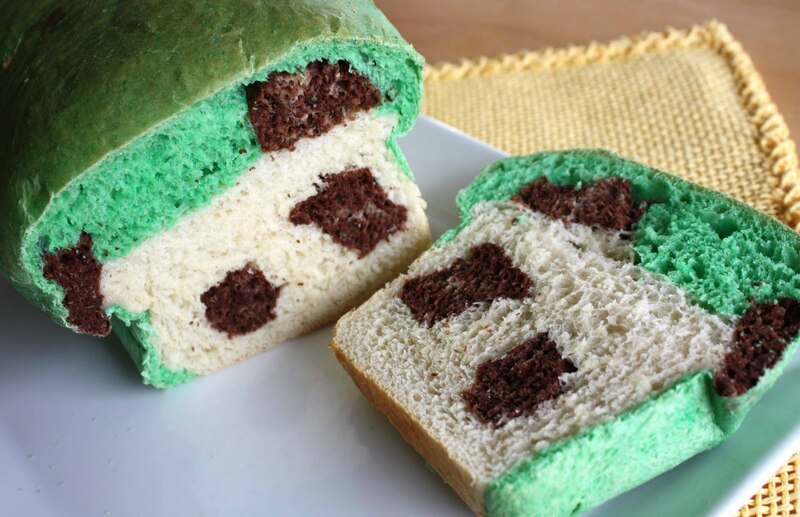 On the outside, just looks like normal bread. How cute is that?! Many of you know that I'm terrible at making bread, so if I can do this, you can, too! Click here to get the recipe and step by step instructions/photos. 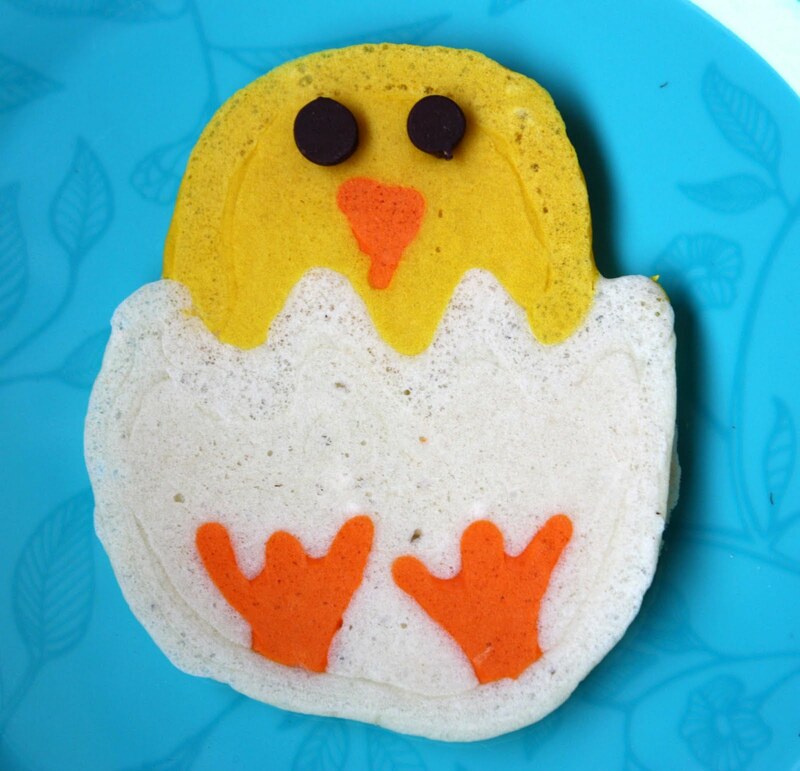 How about some "newly hatched" Chick Pancakes for Easter Breakfast? Pour batter into squeeze bottles, about 3/4 full. Add a few drops orange food coloring to one bottle and a few drops yellow food coloring to another bottle. Shake both well. When entire pancake starts to bubble, flip and cook on the reverse side (about 60-90 seconds). Remove from pan and add two chocolate chips for eyes (my kids each wanted a little pile of chocolate chips on their plates to add their own eyes). Serve immediately. 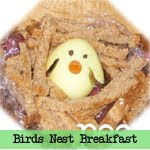 We had fun playing with the extra batter and even made a few "easter eggs" to go along with the chicks. I hope you're having some fun family time this weekend! Happy Easter! It's Entree Week on the Real Women of Philadelphia! Do you have a great main dish recipe that uses new Philadelphia Cooking Creme? It could be worth $25,000! Come on over and join the Real Women of Philadelphia and you could be one of Paula Deen's next "cookin' stars"! Even if you don't have a recipe to submit, it's an amazing community full of great recipes and fun people. I had so much fun whipping up this easy Frittata Primavera, if you're looking for a quick and fabulous brunch dish, this is it! Enjoy! Cook and stir vegetables in 10-inch ovenproof skillet on medium-high heat 3 min. or until crisp-tender. Beat eggs, water and salt in medium bowl with whisk until well blended. Sprinkle cream cheese over vegetables in skillet; cover with egg mixture and vegetables. Bake 30 min. or until frittata is puffed and golden brown. Yield: 8 servings. Variation: If you don't have an ovenproof skillet, cook vegetables in regular skillet as directed. Beat eggs, water and salt in medium bowl with whisk until well blended. Add vegetables and cream cheese; mix well. Pour into 9-inch pie plate sprayed with cooking spray. Bake as directed. Creative Leftovers: A frittata is a great way to use up leftover vegetables and cheeses in your refrigerator. Cut soft cheese into small cubes or shred hard cheeses before mixing with other filling ingredients before pouring into prepared pie plate. Be creative and unafraid to try something new! Ever since the Meringue Bake Shop created "Push Cakes", they've been taking the cupcake world by storm! 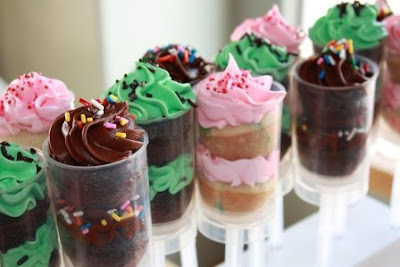 I love this marriage of cupcakes and old-school push pops so we had to make our own... The hard part is finding the supplies, but I finally tracked some down! You can buy the little push pop containers wholesale here. Or, if you are just looking for a few, you can buy them here (more expensive but you can order fewer). I may or may not have just bought 200...which is a little excessive since I've been washing and re-using them. Update: a reader found them wholesale at Culinary Direct, it looks to be the cheapest if you want to buy 100. Thanks, Abby! These are SO EASY to make! 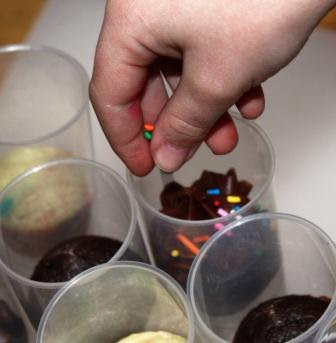 Simply bake your favorite cupcake batter in mini muffin pans. 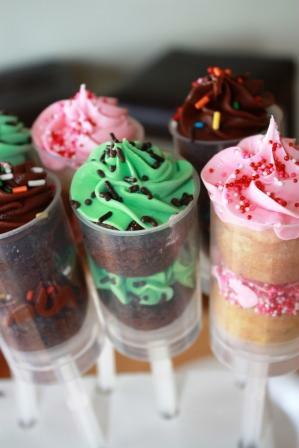 Place one mini cupcake in each push pop tube... Top each with a swirl of your favorite icing. I used a Wilton 1M large star tip. Add some sprinkles... Top with another cupcake, another dallop of icing and more sprinkles. (note: the containers do come with lids but I left them off for the photo:)). The flavors we created in this batch were chocolate/chocolate fudge, mint chocolate chip and strawberry vanilla. My favorite was hands down the mint chocolate chip...yummy! 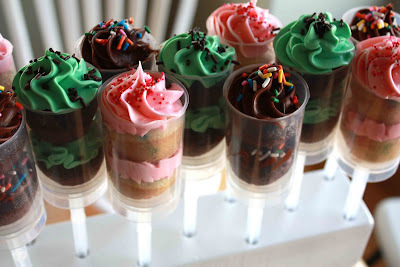 A huge thanks to Gourmet Dad for my fun new Push Pop Cake holder! We bought a 3-inch block of wood at the hardware store, drilled holes about 1/2" deep in it and spray painted it white. It looks so cute on the table, I'll be using it for all our parties and get-togethers this summer! Talk about a sweet centerpiece!